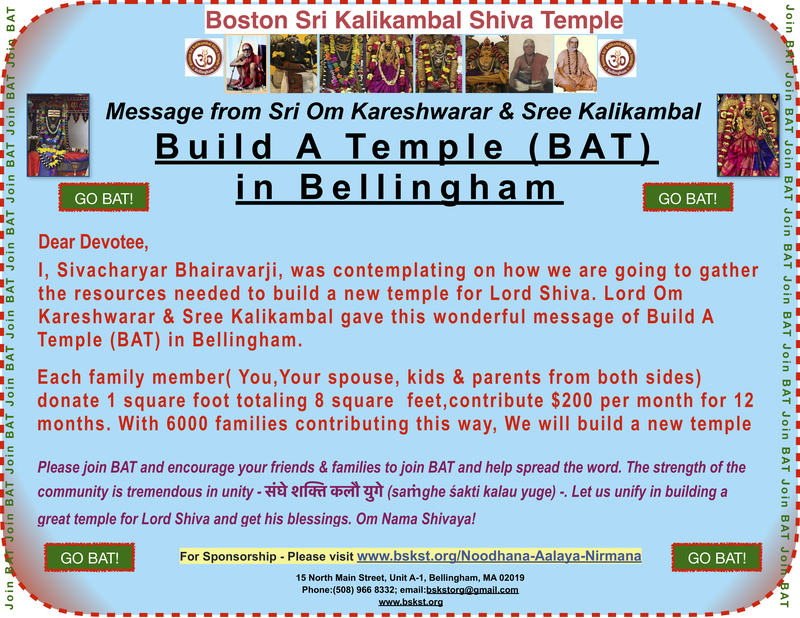 The events that led up to the manifestation of the Boston Sri Kalikambal Siva Temple are truly wonderful and inspiring. In 2010, a large package arrived from India, from my guru Swami Sathasivom. My guru Swami Sathasivom is one of the foremost Saiva and Sakta practitioners in the world today, with years of tapas and intense bhakti towards the Mother. He travels the world performing yagas and consecrating temples, while radiating his grace and touching the lives of thousands of devotees. He has a deep love for the United States, admiring the openness and progress here. Drawn to the bhakti and sincerity of the devotees, he had a unique vision of creating 12 jyotirlinga shrines here, a replica of the 12 ancient jyotirlinga temples of the punyabhumi India. While India is the motherland of ancient Siva temples, there are twelve special temples that are celebrated as the holiest of the holy temples where the Sivalinga is worshipped as a jyotirlinga. The twelve jyotirlingas are Somnatha, Nageshwara, Tryambakeshwara, Bhimashankara, Grishneshwara, Aundha Nagnatha and Parli Baidyanatha in West India; Ramanatha and Mallikarjuna in South India; Baidyanatha, Kashi Vishwanatha and Kedarnatha in North India; and finally, Mahakaleshwara and Omkareshwara in the heart of India. Swami Sathasivom’s vision was to recreate these powerful spiritual centres in the US, where they would dynamically transform the lives of people and bestow success and happiness. I believe he was guided by the vision of his father, my first guru, Sivacharya Kulabhushanam, Sivasri T. S. Sambamurthy Sivacharyar, who was the Chief Priest of Sri Kalikambal Temple, Chennai and at whose feet I was first initiated into the world of priesthood. He was a pioneering adisaiva priest who consecrated several temples around the world, bringing religion to the Indian diaspora. Known simply as Sivacharyar and loved by people for his humility and service, he personified the Grace and Love of the Mother and strove to bring sanatana dharma to every corner of the world. Now, taking his father’s vision further, Swami Sathasivom was setting grand plans in motion for jyotirlinga temples in the US. As a first step, this wonderful Sivalinga, part of the divine sankalpa of my guru, had arrived at my doorstep. It was a majestic, 7 feet tall Sivalinga – a Sahasralinga in fact, with a thousand faces! Rejoicing in the arrival of this special guest, we installed the Sivalinga in the garage of our home along with some other deities we already had, including Mother Sri Kalikambal. I started performing daily worship to the Lord. That was 6 years ago. Five days after the surgery, doctors were pleasantly surprised to see the test results – the mass was benign, not cancerous. To me, it was nothing short of a miracle. I immediately set out to fulfill the promise made to the Lord and Mother Sri Kalikambal that I will find them their own home – a temple. No longer will you be guests, I promised. With the help of friends and devotees, I found the perfect place in Bellingham. The temple came up of its own will. The unique feature of this temple, again by the wonderful vision of Swami Sathasivom, is that there are three Sivalingas. The mula or chief deity is Lord Omkareshwara, in the form of jyotirlinga, established in the agamic tradition, to whom daily nityapuja worship is offered by Sivacharyas as per the Saivagamas. Then, there is the Lord Arunachaleshwara in the form of dhyanalinga, to aid meditation and spiritual growth. Finally, there is the Lord Omkareshwara in the form of atmalinga, a representation of the personal deity of the devotees, to whom devotees can offer worship themselves, with their own hands. The Universal Mother Sri Kalikambal, the Shakti who stands beyond time and space, bestows Her Grace from Her own shrine. The other parivara deities in the temple are Lord Ganesha, Lord Subrahmanya, Lord Bhairava, Lord Anjaneya and Lord Ayyappa. The Ayyappa (Shastha) here is one of the largest in these parts. On the 9th of December 2016, the temple was consecrated in the traditional Saivagama way. Since then, navakalasa mandalabhishekam is being offered to Lord Ganesha and Lord Omkareshwara, scheduled to culminate on 20-21 January 2017 in the auspicious wedding of Lord Siva and Mother Parvati. In my personal experience, the Lord Omkareshwara installed here in Bellingham is a powerful Lord of mercy and healing. He heard my prayers and gave me a new lease of life. Nothing would be too great in His service. It is my humble invitation to devotees to come experience for themselves the potent spiritual energy of the jyotirlinga and be blessed with health, wealth – both material and spiritual and lasting, transformative happiness!